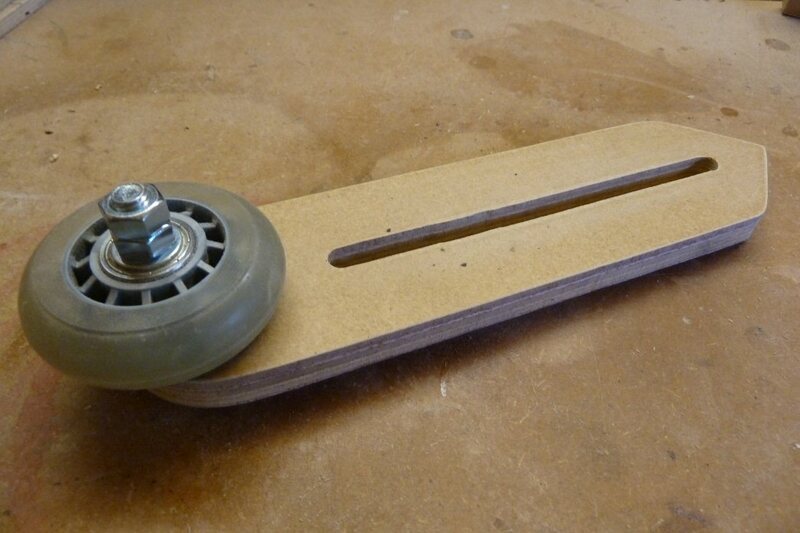 I have seen many photo’s of finished project’s, but never a guide on how to make a 3 wheeled steady, so I thought I would create one. This was for my DVR XP Nova lathe so the measurements are tailored towards that, the critical measurement is the distance from the bed to the headstock centre to create the maximum sized steady (of course smaller sizes can be created, but I wanted maximum vesatility). 3 x “62 x 18mm” rollerblade wheels (can be purchased from a well known online auction site – I went for the smallest diameter wheels I could find to maximise the diameter of item to hold in the furthest range, but to also ensure when the arms were as far into the centre of the frame it would still hold thin work items before the wheels touched. The bigger the wheel the less range of use you will have). Cut out all the components as shown in the diagram below. It is best to use a 9mm router bit to create the groove in the arms. Glue the 2 main frame components together. I used standard PVA for all the glueing. Glue the main foot components together. 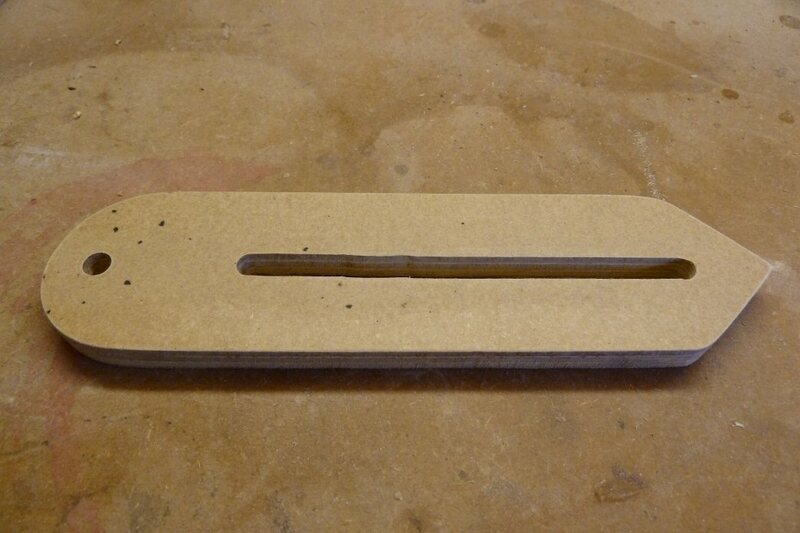 Glue the plywood and hardboard components of the arms, bed runner and foot clamp together. 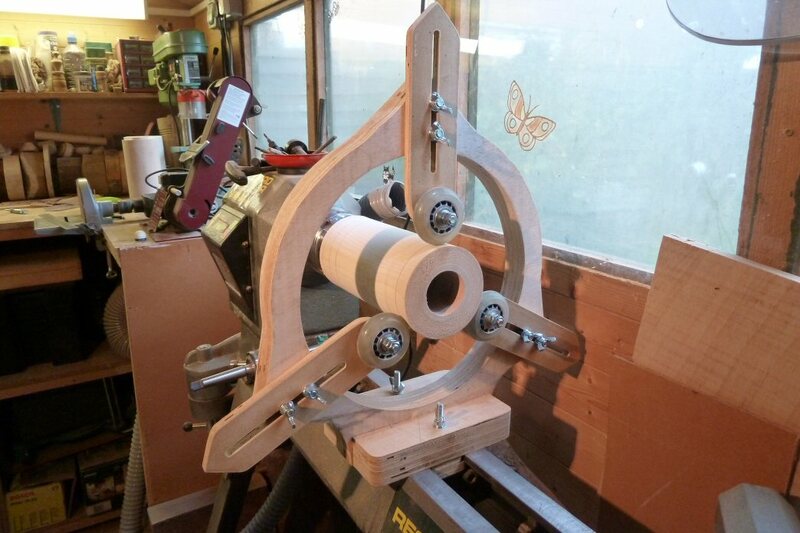 The reason I chose to lamitate the playwood and hardboard together was for extrea strength, but to also use the smooth surface of the hardboard on the pieces that connect to the lathe or with the moving washers/bolts. Once all the glue on the components has fully dried I further cut out the the details and sanded/smoothed off any rough surfaces. 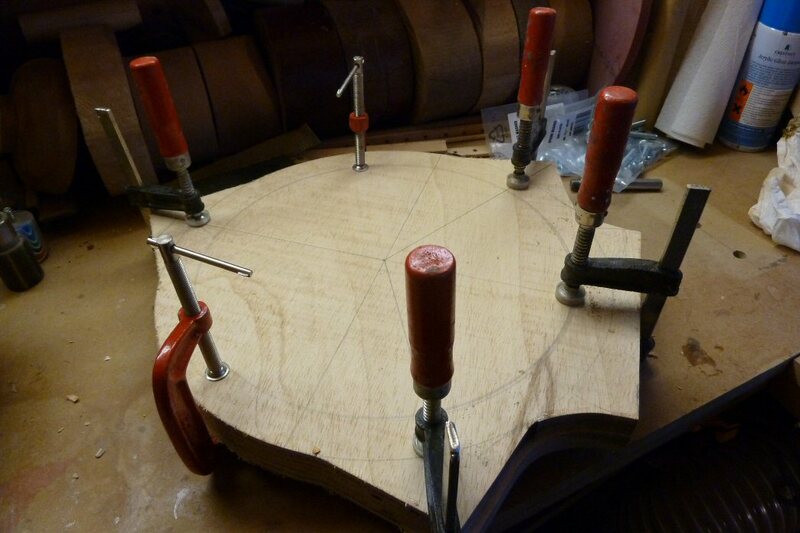 This involved cutting out the inner circle of the main frame and the grooves/slots in the arms. 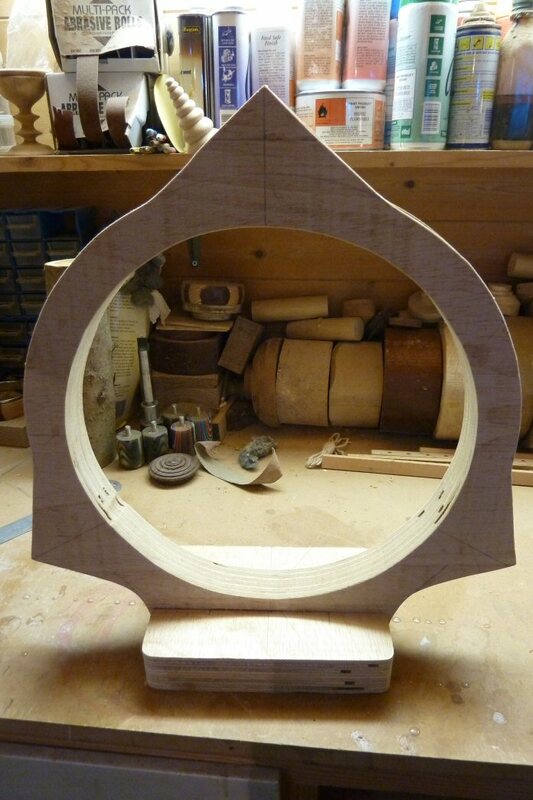 I used a jigsaw for the internal circle in the main frame and a router for the arm slots. Note – you can drill the 9mm holes at any time in this process that is convienent to you. I pesonally did it once all the conponents were glued, but before I started to connect the individual components together. Ensure the main frame slots into the foot cleanly and make minor cutting/sanding adjustments to ensure. 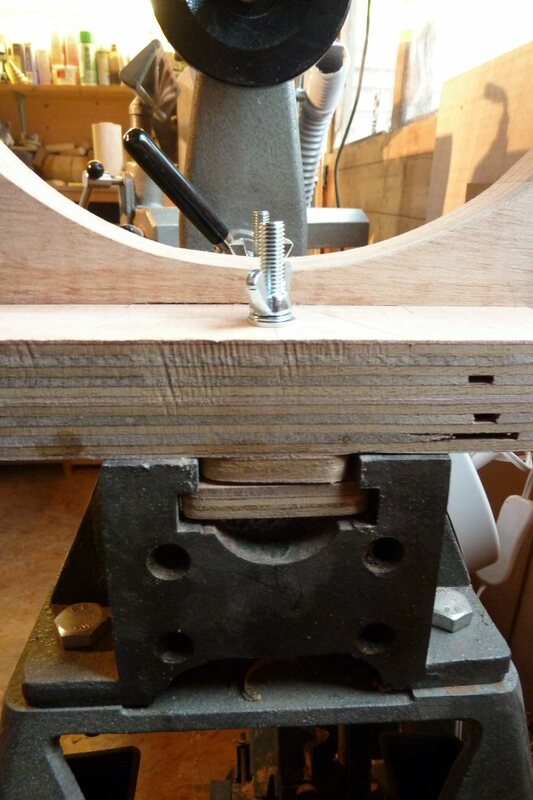 The main frame must sit at 90 degrees to the foot and perfectly central (always remember this must align perfectly to the centre of your headstock drive). Glue the foot to the main frame. Once this has dried, glue the bed runner to the foot – again ensure this is perfectly central and running 90 degrees to the face of the main frame. 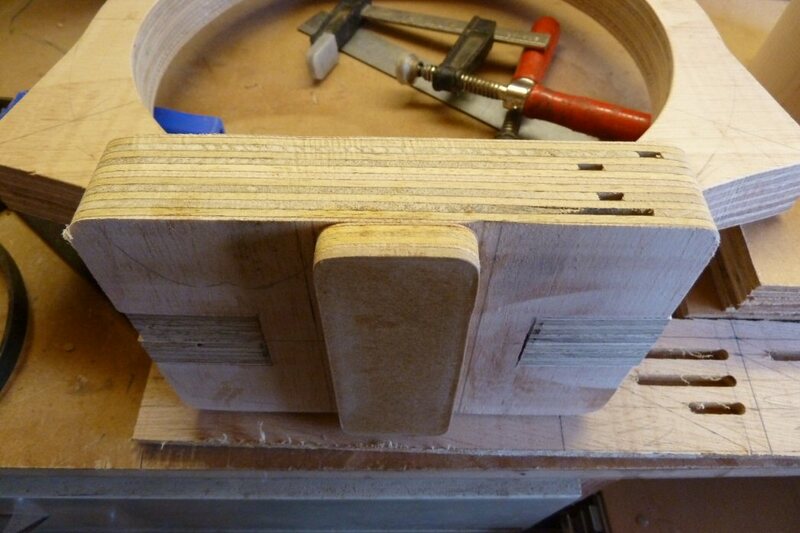 If not already done so – drill the 2x 9mm holes through the foot, bed runner and foot clamp. From the bottom up insert a 150mm M8 bolt, washer, foot clamp (hardboard surface facing the bed runner/foot), bedrunner/foot, washer, spring washer and finally the wing nut through each hole. slot the steady into the lathe bed and check it runs smoothly, refine the shape of the footclamp if any “pinches” are felt, like rounding the corners/surfaces. Assembling the arms is best described in 2 parts. First is connecting the wheels to the arms. assemble the wheel fixture in the following order: 90mm M8 bolt, washer, arm (hardboard surface facing towards the wheel), washer, bearing, wheel, bearing, washer, M8 nut x2. Tighten the first nut so the wheel will turn on the bearings but the assembly does not wiggle. Once the first nut is tight enough, tighten the second nut to it to lock the assembly into place. Second is attaching the arm to the frame. assemble each arm in the following order (remember it is 2 bolt assemblies per arm): 90mm M8 bolt, washer, arm (hardboard surface facing away from the frame), washer, spring washer and wing nut. 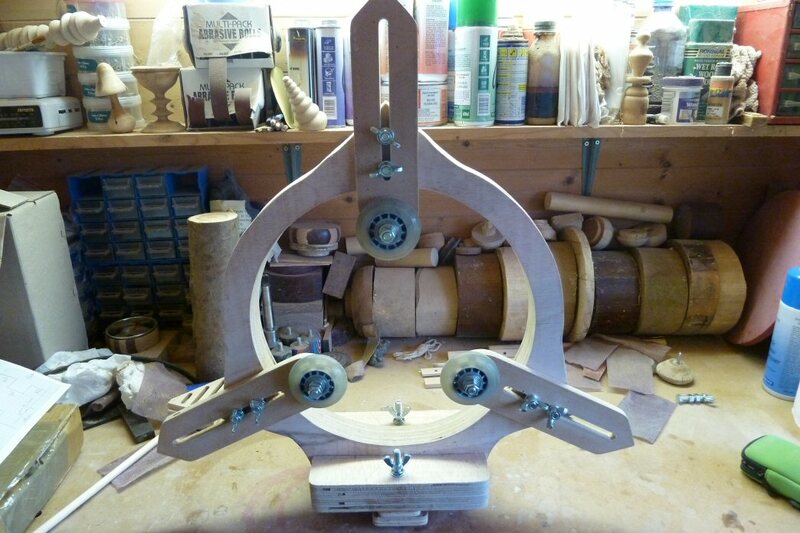 Once all the arms are attached to the main frame, the steady reast can be put back onto the lathe for testing. Move the arms towards the piece of work so that the wheels firmly touch the work and tighten the arm wing nuts. Ensure you double check all the nuts are secure before turning the lathe on. Start at a low speed just in case. Once you are happy the steady is performing well (no vibrations due to being off centre or not 90degress to lathe bed), then you are ready, with steady and go. Sound simple design even with a bit of styling! Well documented with good photos. “Outstanding” Thanks for sharing your design and the pix are also great. Sawal selby, 30-march- 2013. 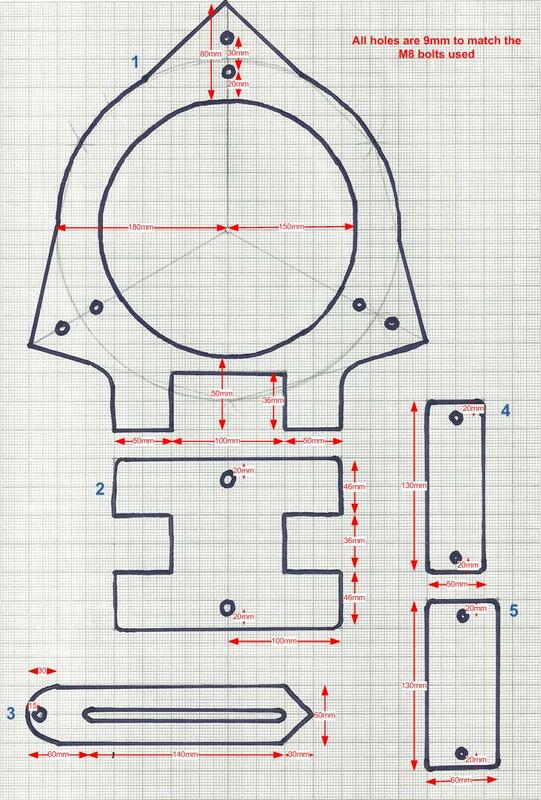 Thanks for sharing your disign and easy to follow the diagram and good photos. Thank you for this design easy to follow instructions used caster wheels off a old vac cleaner & made brass bushes & mounted them into a fork like assembly works well. I needed a steady rest and looked at a dozen similar designs. This was the best of its type by far so I made one. Thanks for the detailed info. and photos. My only significant modification was to narrow the arms to 47 x 18mm and recess them 12mm into the frame and make them from hardwood (kwila) I had in the scrap wood pile. 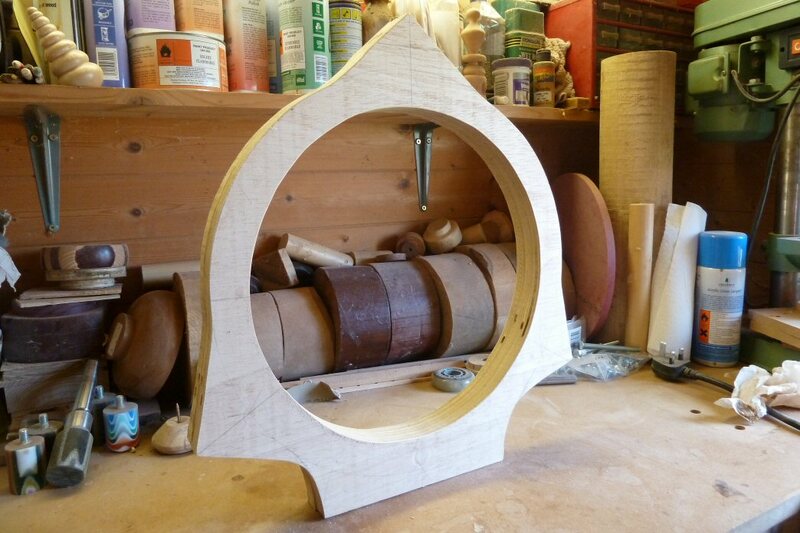 I used radiata pine ply for the frame so the contrasting colours look attractive too. Very few designs include pairs of holding bolts on the arms – a simple, inexpensive and sensible feature. I’m delighted with the results – very strong and safe. Thanks again. Just for the record, I’m not a member of this club. I live in New Zealand and belong to the West Auckland Woodturners’ Guild where the design has drawn many admiring comments. So, Phil Bristow’s efforts have reached around the world!